A variety of factors can influence sales of solar PV systems and with this report an attempt has been made to estimate the impact of load-shedding on the sales of solar systems. Organic growth is usually a period of stable and consistent growth seen during periods where users and consumers of electricity gradually buy into a technology. Organic growth in South Africa has occurred mainly because of awareness of the technology and/or trust in a specific technology, coupled with the belief that the technology is proven and adds value. Growth patterns during periods of organic growth are usually consistent and stable as could be seen in the growth of the solar PV market in South Africa since 2016. Had the market only grown organically, growth would have been as is reflected in Graph ibr.5 in section 6 of this report. Synthetic growth is caused by sudden market fluctuations. Examples of market conditions that force synthetic growth are load-shedding cycles for the energy sector and the water crisis experienced by the Western Cape in 2018. These conditions force consumers to alter their normal way of life in order to sustain business and maintain expected standard of living. Synthetic growth is generally considered to be disruptive, as entrepreneurs identify sudden demands in a sector and invest into that demand without understanding the market drivers. This interim investment is often shortsighted as prices being charged for services are not market related and often delivered in the absence of industry related standards and benchmarks. With load-shedding being re-introduced during 2018, new entrants into the energy market would have an impact on the sale of solar and energy related systems due to the synthetic demand being created. 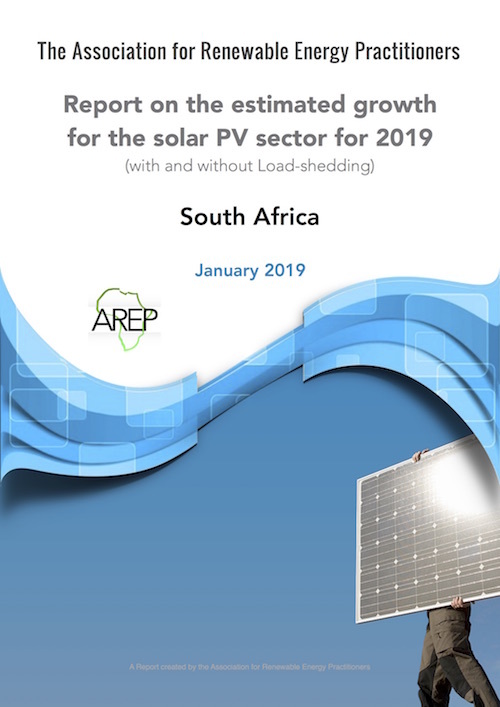 This report aims to estimate the impact of load-shedding cycles on the sales of solar PV systems. Data used in this report was combined with existing PQRS data, as well as, new data showing the volume of exports from China to South Africa. A simplified projection methodology can be seen under item 3. Modules imported into South Africa from other countries such as India, the USA and parts of Europe may not have been included in this report. The volume of original data made it possible to expand the scope of the report to include sales for Solar PV systems in 5 African countries as indicated in Graph 4. Historic data indicates inflated growth in solar PV sales during periods of loadshedding. During the 2013/2014 period, South Afica saw intermittent loadshedding for a variety of reasons ranging from low dam levels in the Drakensburg to low coal-stockpiles. Other reasons cited in the media related to maintenance of Eskom generator plants. Graph 1 indicates the impact of load-shedding on solar PV sales when looking at three respective sectors in which the installations were done, being; Residential, Commercial / Industrial and Agricultural. Graph 1 shows the impact on solar PV sales during the previous 2014-2015 load-shedding cycle. Data from this period was used in order to determine the impact of load-shedding on the sales of PV modules for the Jan-Dec 2019 period Graph 1 is only accessible for Level 4 members. Kindly Login or Upgrade. The following factors have a direct impact on the way in which sales projections of solar PV systems in South Africa have been reflected within this report. Historical impact during load-shedding based on system sizing. Section 5 is only accessible for FREE members or members with a subscription Level 1,2,3 or 4. Kindly Login or Upgrade. Graph esp-1 draws a comparison between the Rand/Dollar exchange rate from 2014 and the retail selling price in Rand per watt for solar PV modules. Comparisons are indicated in quarterly averages over the 4 year period. Graph ESP-1 is only accessible for Level 4 members. Kindly Login or Upgrade. During October 2017, PQRS projected estimated sales for the solar PV sector for the period Jan-Dec 2018 to be in the region of 190-210MW. The total sales for solar PV modules for the period Jan-Dec 2018 can be confirmed as being in the projected range by looking at the total exports from China to South Africa for the 2018 period. Graph ibr-5 shows growth in the PV module sector from 2011 to 2021 and shows what the organic growth rate would be for the sector in the absence of load-shedding. Graph IBR-5 is accessible for FREE, level 1,2,3 or 4 members. Kindly Login or Upgrade. Graph 4 shows exports from China to South Africa. Total sales volumes were adjusted to make provision for modules exported from South Africa to neighbouring countries. Graph 4 indicates >200MW exported to South Africa from China. It is possible to assume, based on these figures, that the sales for solar PV modules for South Africa is consistent with the estimated and projected values indicated in Graph 4. Data obtained on exports from China can be deemed to support solar PV sales projections for 2018 made by PQRS in 2017. 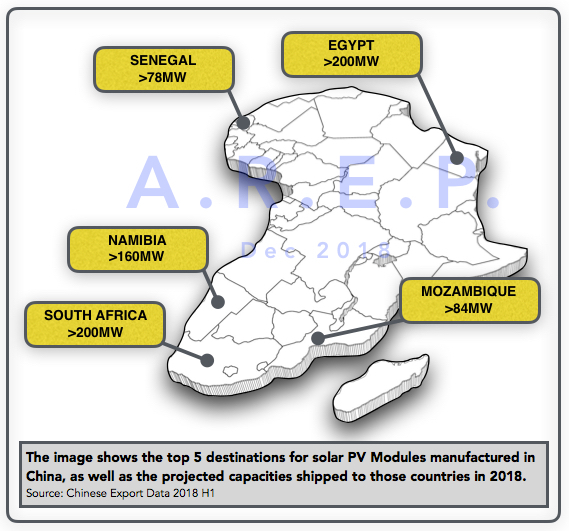 Graph 4 shows the capacity for solar PV modules exported from China and compares Chinese module exports to 5 African countries including South Africa, Senegal, Namibia, Mozambique and Egypt. Previous growth for systems between 50 and 999kWp were 77% due to aggressive load-shedding implemented by Eskom around 2014/2015. For the 2018/2019 period, the impact of sales on PV systems will not be as significant due to a decline in economic growth, coupled with a less aggressive load-shedding cycle. On the flip-side an increase in sales commercial and industrial PV systems can be observed due to financial mechanisms for solar PV systems maturing, coupled with tax incentives and the added advantage of Solar PV energy being cheaper than the cost of grid energy for some users within certain municipal regions. Graph LE-1 is only accessible for Level 4 members. Kindly Login or Upgrade. The total installed generation capacity for privately owned rooftop and ground-mount systems is estimated to exceed 700MW during H1 2019. An average downward error margin of 10% on reflected values can be taken into consideration. In order to provide a realistic and conservative estimation, both upper and lower limits have been identified and indicated in graph bd-3 below. The estimated additional rooftop generation capacity likely to be added to the South African grid during 2019 varies between 244MW – 330MW. For 2019 growth is largely affected by the impact of Eskom tariff increases and load-shedding cycles being implemented. The intensity of load-shedding cycles will have a significant impact on rooftop installations. It is also estimated that South Africa will exceed 1GWp of rooftop capacity during the January to December 2020 period. Graph bd-3 is only accessible for Level 4 members. Kindly Login or Upgrade. For the Jan – Dec 2018 period more than 200MW’s worth of solar PV modules were sold or installed in South Africa in the rooftop & Ground-mount, C&I, residential and Agricultural sectors. With continued load-shedding cycles SA could possibly exceed 1GWp of rooftop installed in SA before the end of 2020 based on current trends. Estimated current total installed generation capacity for privately owned Rooftop and Ground-mount Solar PV systems could exceed the 700MW mark during the first half of 2019. Sales and installations for solar PV systems in South Africa for Jan – Dec 2019 is estimated at being between 245 to >315MW depending on grid stability and Eskom tariff hikes. Download the report here This report can only be downloaded by Level 4 subscribers. Kindly Login or Upgrade. References are only accessible for Level 4 members. Kindly Login or Upgrade. The gazetted notice can be viewed or downloaded from the arepenergy.co.za website. Join the online discussion as we discuss the pro's and con's to the proposed 10% increase in tariffs. Comment on the proposed tariff increase should be submitted by 29th April. The Association for Renewable Energy Practitioners will submit a full report on the matter subsequent to interaction and engagement with the solar sector.